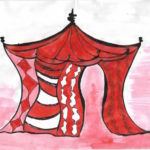 Home > Blog > Uncategorized > What is a Red Tent? Come inside the tent. You are welcome here. Leave the titles and roles you have in your life outside the red fabric doorway. See the hand of sisterhood extended out in front to you. Choose your cushion. Feel the communion of being with others. Get comfy as you sit settling into your body. Be here in this present moment. And breathe deep down to your belly. Close your eyes. Languish generously in the gift of time to go within and explore the mystery that lies in your inner knowing, sharing with others whilst being in the safety of the red opulent surroundings. 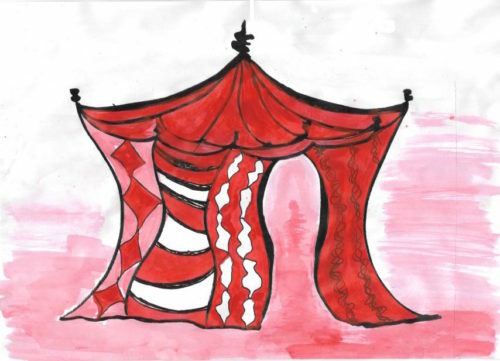 What does a Red Tent look like? Imagine beautiful plush red fabrics shimmering with gold thread and small silver mirrors all around this intimate cosy space, cocooning and enwrapping you in warmth with their velvety softness. Within the centre of this sacred space there’s an altar of offerings – a burning candle, feathers, crystals and flowers surrounded by a circle of deep ruby red cushions. The colour red is symbolic of the red thread that connects all women together by their menstrual blood – whether that has physically finished in your life and you are menopausal or post menopause or is about to begin for young girls. Consciously surrounding yourself in red items and wearing something – earrings, lipstick, jewelry helps the energies in the tent to bond and unite together. What is the Red Tent history? The idea of a menstrual hut existed in pre-modern cultures when women came together to bleed directly onto the ground. The female cycle was revered and worshipped in ancient cultures by men and women for its life bearing capacity. Consequently women honoured their bodies once a month whilst living life at a different pace without responsibility and resting. Native American Moon Lodges took place once a month bringing women together to celebrate the female connection with the feminine goddess of the moon. Anita Diamant’s novel The Red Tent in 1997 gave a welcome impetus to women to come together and form their own Red Tents worldwide. In this international bestseller the life of Dinah in the bible is followed from before her birth through her life, centering around her mothers monthly time in the tent gathered together at every New Moon to bleed, share, help and educate each other in a shared space. Although fictitious and without biblical evidence, the story promotes the collectivity and power of women when gathered together. What happens in a Red tent? The space is opened and there will be a discussion of topics and issues in life, followed by a guided meditation to relax, access your inner wisdom or connect with the seasons, your creativity and the phases of the moon. Individual guidance from the Womanrune cards is offered to those women with particular questions. It’s a dedicated place to talk about women’s spirituality, phases of womanhood and the menstrual cycle. It’s an example of what’s possible, women witnessing others, listening with intent, collaborating without offering answers and giving advice when it’s asked for. What happens in the circle stays in the circle including what is said by everyone. When you enter the Red Tent you agree to keep the confidence of others. They are for women of all ages, cultures and religions who want to come together to be with other women and share their stories. Open-minded and accepting with a willingness to share, explore, dive deeper and talk about the issues affecting you in your life. Why come to a Red Tent? It’s a time to speak and listen from the heart. It’s a place to take care of the self, It’s a space for connection. Deciding to come inside a Red Tent is a conscious act, acknowledging the need for time for yourself to go within and explore your inner landscape. Come to heal, celebrate, empower and to stand up for a healthier world for yourself, daughters, sisters and women of the world. Monthly gatherings – join us online Thursday 1 March 21.00 – 22.00 CET time and Thursday 5 April 21.00-22.00. Add your email here to receive joining details.